The Airstream Interstate is great for traveling on your next adventure. Whether it’s a cross-country trip or just getting away for the weekend, this Class B Motorhome has all the features of a larger motor home, while maintaining the fuel economy and maneuverability of a van. 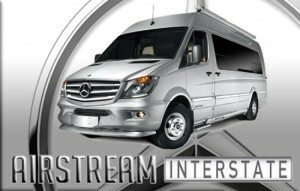 Airstream has always been known for their iconic travel trailers, the best in class Interstate is no exception. Midwest Automotive Designs features 2 different floor plans. 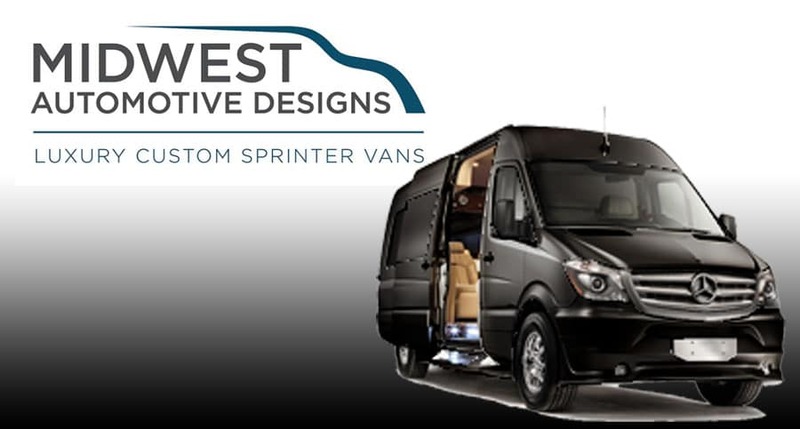 These Sprinter RV vans lets you take everything you need along for the ride, while traveling in high style. The utility of a camper van combined with the luxury of a Business Class conversion van. Our luxury camper vans offer the high-end trim finishes of our exclusive business class vans with some of the popular amenities. 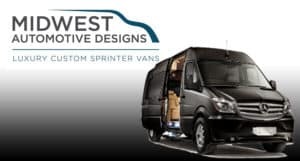 If you are looking to hit the road in an RV, the Weekender and Daycruiser Class B by Midwest Automotive Designs offers great performance, incredible luxury, and technology. The Winnebago Era features 3 accommodating floor plans. The 70A features twin beds at the rear that can also be converted into a Queen size bed, along with a smaller sofa bed at the front. The 70X floor plan features a rear sofa bed and 4 front captains chairs, which is great for traveling with a group of passengers. The All-New 70C floor plan features a driver side slide-out with a sofa bed and rear bathroom. 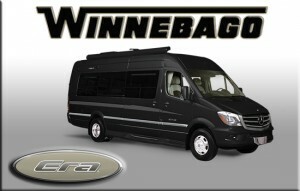 The Winnebago Era Class B Motorhomes are perfect for traveling and camping at your favorite sites. 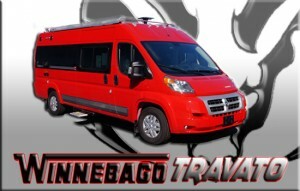 The Winnebago Travato Class B from Winnebago Touring Coach. This Class B Motorhome has great value and is built for adventure. Utilizing the RAM ProMaster Van Chassis, Winnebago offers 2 great floor plans. The 59G floorplan offers a rear 46 x 77 bed, while the 59K provides a twin bed layout. Exterior speakers provide a nice soundtrack to wherever you decide to set up camp, while the awning will protect you from the sun and rain. The Pleasure-Way Pursuit is a little larger than your traditional Class B Motorhome. Many know it as a Class B Plus Motorhome because of the wide-body and it is built on the Ford E-350 Chassis. The Pursuit features 2 floorplans, one featuring an optional over-cab bunk. The bathroom is spacious and features a large glass and Corian shower. This motor home is great for those looking for some extra space, without having to up-size to a larger Class C Motorhome. 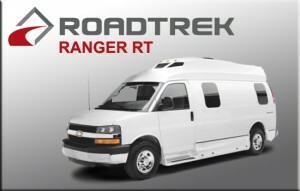 The Roadtrek Ranger RT features a light weight chassis and smaller engine, which leads to better fuel economy. This environmentally friendly Class B Motorhome is practical and features all the luxuries of a fully furnished camper van. When driving the Ranger RT you will notice an “open feel” which makes driving and sight seeing a breeze. Using only gasoline and electric power sources, this Class B Van simplifies operation and minimizes maintenance. The Roadtrek 170 Versatile is adaptable to its passengers needs. This Class B Motorhome is able to haul 6 Passengers and provides sleeping accommodations for 4 people. 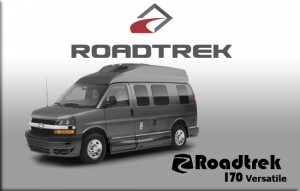 Driving, Parking, and maneuvering is simple thanks to the convenient size of the Roadtrek 170 Versatile. 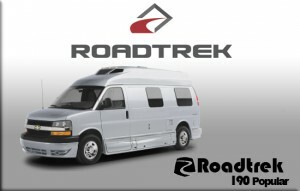 The Roadtrek 190 Popular has been a staple in the Roadtrek line up since the beginning. This Class B Motorhome has the ability to seat up to 6 passengers, and sleeping up to 3 persons. The galley features a microwave and 2 burner stove that makes meal preparation at camp, or while on the road very convenient. 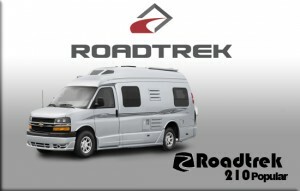 The Roadtrek 210 Popular is considered the ultimate Class B Motorhome with a wide-body. The unique wide-body allows for more room in the rear of the coach. This Class B Camper Van allows sleeping for 3 people and can travel with up to 5 passengers. The rear power sofa quickly converts in to either a king size bed or 2 twin beds. 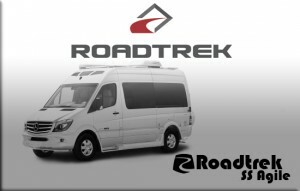 The Roadtrek SS Agile is built on the Mercedes-Benz Short Sprinter Van Chassis. This Class B Motorhome is very easy to drive and provides great fuel economy. The large frameless windows allow natural light to shine in, and provide a great view at camp and while traveling. This Diesel Class B allows sleeping for 2 and seating for 5. The Roadtrek CS Adventurous is built with the avid camper and RV’er in mind. The large windows and sleek styling allow for great views and plenty of storage. This Class B Motorhome provides many features and comforts for making your next camping trip most enjoyable. Once you step foot in the CS Adventurous, you will hear adventure calling. 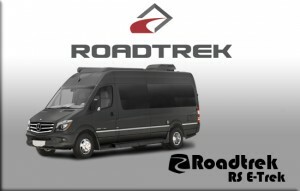 The Roadtrek RS Adventurous is built for traveling and life on the open road. This Class B Motorhome is powered by a Mercedes Benz 3.0L V6 Diesel engine and provides a great amount of storage while being easy to maneuver and park at your favorite camp site. There are many designing options to personalize to your taste. 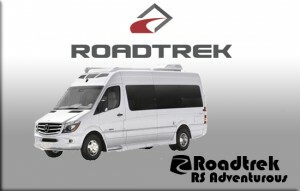 The Roadtrek RS E-Trek is one of the most Eco-Friendly Class B Motorhomes on the market. With this functional layout, you can haul 7 passengers and sleep 4. This Class B Motorhome features a 240 Watt Solar Panel along with 6 Lithium Ion Batteries, leaving your dependance for an electrical connection scarce. 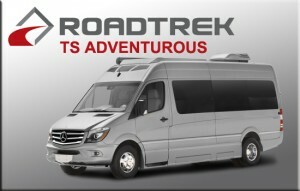 The Roadtrek TS Adventurous brings a whole new meaning of luxury to the table. The TS features chrome accents and dark leather materials for a luxurious look. With the innovative coach-connect, you can check the status of holding tanks, batteries, and even control the lighting…right from your smartphone! This Class B Motorhome will ensure maximum comfort no matter where your travels take you! 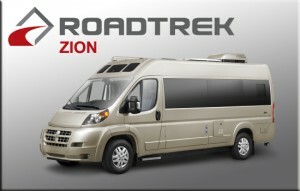 The Roadtrek Zion is built on the Ram ProMaster Chassis, which features a gasoline engine. This affordable Class B Motorhome will seat up to 5 people and sleep up to 3. Your adventure is awaiting to be conquered with the all new Roadtrek Zion.